When will be The Bill Dana Show next episode air date? Is The Bill Dana Show renewed or cancelled? Where to countdown The Bill Dana Show air dates? Is The Bill Dana Show worth watching? Jose Jimenez (Bill Dana) is a Latin American immigrant who works as a bellhop at the Park Central Hotel. He also lived in a special bachelor section of the hotel. His biggest obstacles were another bellhop by the name of Eddie (Gary Crosby), hotel manager Phillips (Jonathan Harris), and hotel detective Glick (Don Adams). The show was a spin-off of Make Room for Daddy as Dana had originated the character of Jose on that series. Crosby left the series after its first season and was replaced by Maggie Peterson as Susie, a waitress in the hotel's coffee shop. 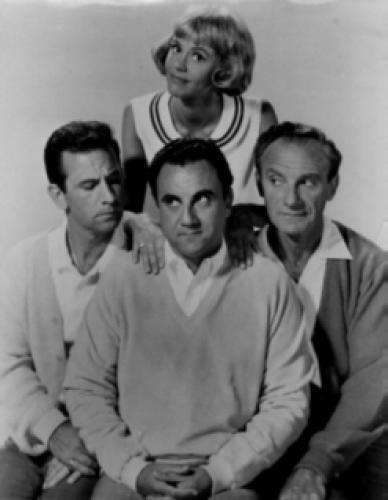 Despite sharp writing which provided more than a few laughs the show was up against the popular and long-running Ed Sullivan Show on CBS and found itself on the cancellation floor after a year and a half on the air and 42 episodes. EpisoDate.com is your TV show guide to Countdown The Bill Dana Show Episode Air Dates and to stay in touch with The Bill Dana Show next episode Air Date and your others favorite TV Shows. Add the shows you like to a "Watchlist" and let the site take it from there.